The LaBa! Art Festival took place on 27th May 2017 on Bukoto Street in Kamwokya, Kampala. 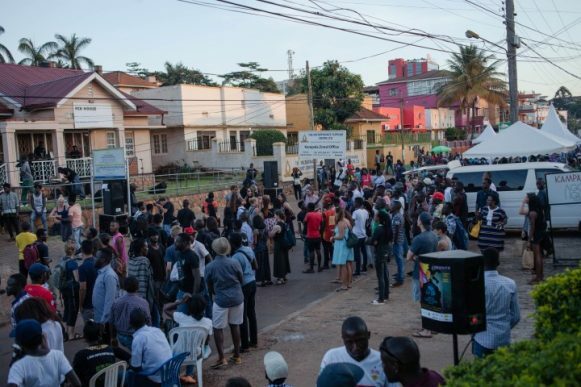 Goethe-Zentrum Kampala (GZK) organized the festival. Eleven collective installations were exhibited for eleven hours along the road amidst interludes of performing arts including poetry, music, dance and drumming. 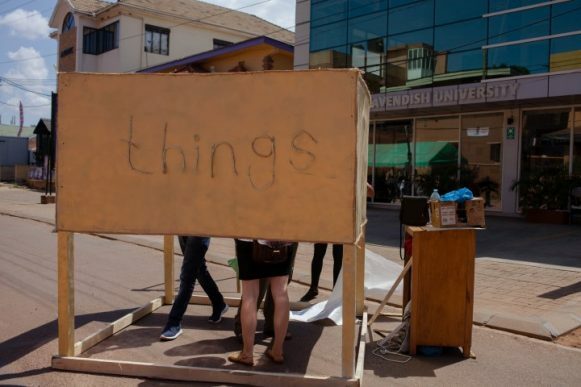 Participating Ugandan and international artists responded to an open call restricted to collectives and the theme of Ubuntu. I wish to talk about Ubuntu as a word, as a philosophy and as a method. Ubuntu is a Bantu word. It originates from the Nguni of South Africa. The root “ntu” means humanity, but when translated, it can mean humanity towards others, or the quality of being human or humaneness or humanness. Ubuntu can be translated in Luganda as Obuntu bulamu, which means a socially healthy way of being a human being. According to Ubuntu thought, one is a true human person only when they are available for the community, for the other human beings and for the natural environment. Therefore, one’s true self emerges from their human relation with others. A true human being lives in constant communication and communion with others and also with nature. To be a human being does not necessarily mean you possess Ubuntu. The quality of being human may differ in different human beings. In some, it might be almost lacking, and in others it might be sufficient; in others it might be abundant and for some, it might not be there at all. According to Ubuntu thought, as human persons, we have the duty of being humane to others. It is not a choice. It is an obligation to be caring, kind, gentle, compassionate and civilized. Ubuntu is an African system of thought about how we should conduct ourselves as human beings. It denotes showing respect, being trustworthy and being honest to one another. After his presentation, Kasozi was asked to expound on the relevance and validity of Ubuntu in the current times where the world is arguably monetary and individualistic. In response, and this is where my argument for this article rests, he emphasized that, Ubuntu is a behavior that one needs to know about and only after that, can they make an informed choice to live it. Hence there is no persuasion involved. In this article I argue that the notion of Ubuntu was not successfully encapsulated in the exhibited artwork because Ubuntu is too complicated an idea that art as a medium could not personify it. A handful of artists remarkably tried to portray Ubuntu in their artwork but there was a limit as to what they could achieve. 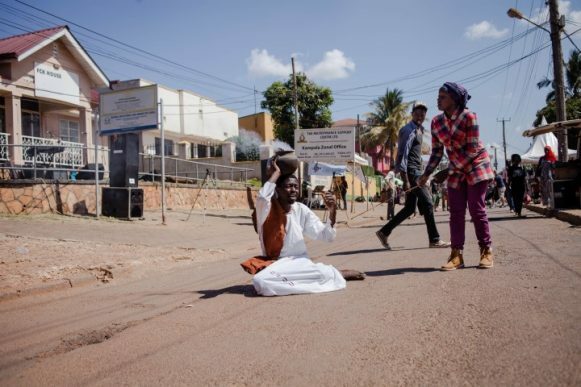 The majority of the artists ignored the virtues of Ubuntu as elucidated by Kasozi in the Laba! Art Forum. They did not, for example, think about the idea that Kasozi brings forth in his presentation – that there should not be any persuasiveness, but that the individual should know what Ubuntu is and then make a choice to live it or not. And, the fact that a don at Makerere University was invited to talk about the topic also meant that this is a complex theme, which needed specific professional articulation from an expert. As such, we cannot take it for granted that the artists or the audience knew what to expect. The Art Forum, which would serve as an eye opener, was held in a small conference room at Goethe Zentrum offices, yet the festival receives about a thousand people. So there was an inevitable limit to who would access this crucial orientation to Ubuntu. In this review, I analyze some of the installations and their attempt in portraying or challenging the festival theme. It is important to emphasize that the complexity of Ubuntu in itself was a blockade for all the participating artists and to some extent the audience. Notwithstanding the complexity, I observed that some artists were outstanding in their attempt to portray the theme. In this regard, the most successful projects for the day were those by Kikali Studio, Creative Minds, and Kitara Nation Poets. Kikali Studio, a collective of illustrators, animators, graphic designers and writers, showed a short film called Sabuula Embaata. The three-minute film is named after a slang commonly used by city dwellers to urge a taxi driver to knock any pedestrian who appears redundant on the road. When such an incident happens, they always exclaim in unison: Sabuula Embaata! which directly translates to hit that duck! The film not only tells the story of a teenage girl who falls victim of “redundancy” but also visualizes the implied hatred, callousness and inhuman desire within people to watch others get hurt. It alludes to how people rush to judge others from outward appearances without necessarily thinking about their circumstances. Hence, Sabuula Embaata attempts to challenges the theme of Ubuntu, in a way that it reminds us how appearances corrupt our perceptions and how they affect how we relate to strangers around us. Kitara Nation Poets recited four poems at different intervals, which talked about politics, love and masculinity, cultural setups, colonialism, and sectarianism. All the topics they echoed were familiar in the lives of many people, which accorded them the attention and dialogue they deserved. More than the message, the poets managed to grab attention during their presentation by wearing yellow t-shirts (yellow is the color of the current ruling party in Uganda) as well as speaking loudly and with charisma. The poetry sessions were led by writer and acclaimed poet, Peter Kagayi. 1st person: What is going on here? 2nd person: You choose a question, look in the camera, and we shall record you answering it. I had the same sentiments with the Let Us Bee One mural by Aphra Arts Org. 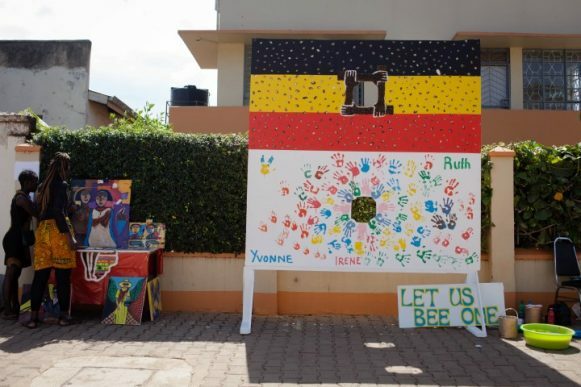 I credited the symbolic use of bees and the Ugandan flag colours, but I was disgruntled when it came to persuading the audience into stamping their palms on to the mural as a sign of agreement to Ubuntu. For me, this ended up being a mere gesture of playing with colour. 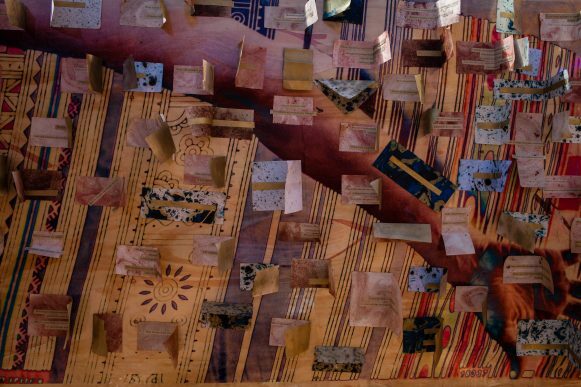 The third artwork I discuss here was the so-called Collaborative Mural by Neema Iyer. Painting on top of another person’s painting seemed enjoyable especially for those of us who have never painted. However, this did not in any way allow the many painters to have an interaction. People mostly painted in silence. The few who talked were those who knew each other either as friends or family. So the idea remained a self-indulging one. One could hardly witness any collaboration except painting layer upon layer and playing with colour. Three questions: how does stamping one’s hand on a mural signify their willingness to support Ubuntu? Or how does one painting on the Collaborative Mural portray Ubuntu, when the painters could not interact with each other during the process? Or how does briefly responding to a random question in front of the camera relate to Ubuntu? None of the three installations seems to answer these questions, which illustrates the complexity of the theme not only in execution but also in real life just like I quote Komakech at the beginning of this article. During and after the festival, many people gave negative feedback, which was a good thing because it allowed the organizer the space to rethink the festival’s origins, aims and presentation. However, the reception for this year’s LaBa! Art Festival was different for two kinds of people. The first category (to which I belong) comprised of people who were attending the festival for the first time, hence allowing themselves the opportunity to comprehend, interact and appreciate what was available. The second category comprised of those who had seen some, or all, of the past festival’s editions. These were preoccupied with comparisons and often denied themselves the space to observe what was available with an open mind. Nonetheless, it is not enough for one to say LaBa! was good or bad. This tendency is common for many of our artistic events. People always give one word comments like: interesting, great, bad! I think it is crucial that people stand up and speak up about what exactly did not go well. This year’s festival had two unique features namely: The LaBa! Art Forum which happened a month before the festival and the LaBa! Audience Award. Creative Minds collective won the LaBa! Audience Award. 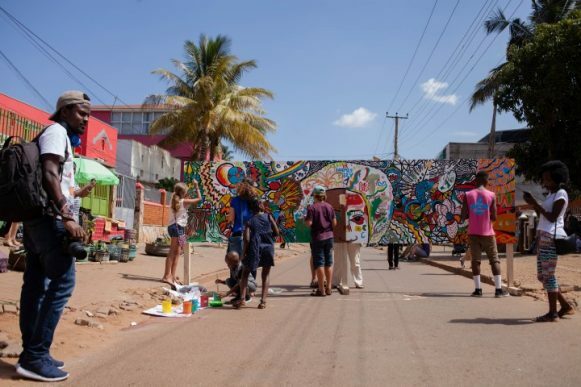 The award was introduced to motivate participating artists by giving a member of the winning collective an all-costs-paid travel to Chale Wote Street Art Festival in Accra, Ghana in August 2017 with the Moving Africa programme by Goethe-Institut. Ubuntu is a broad and idealistic theme which art as a medium could not successfully portray. Although artists tried to work with it, it was quite impossible. It is equivalent to what my late grandmother would say, trying to draw water from a well using a woven basket. Besides, working together, especially as artists is not something we should render simple. I spoke with many of the artists and most of them talked about the challenges involved, even in the early process of preparing application material. In the country where we have few established artistic collectives, this was not going to be an easy working option. Hence the few who brought themselves together tried to work collaboratively but found themselves struggling with ideas and execution, something which was visible in many of the installations. Martha Kazungu is a Ugandan curator and writer, currently living in Bayreuth, Germany where she is taking her Masters at Bayreuth University. She has contributed articles for Start Journal, Contemporary And as well as Art Africa Magazine. She is also Asiko Art School Alumni for 2016 and 2017.